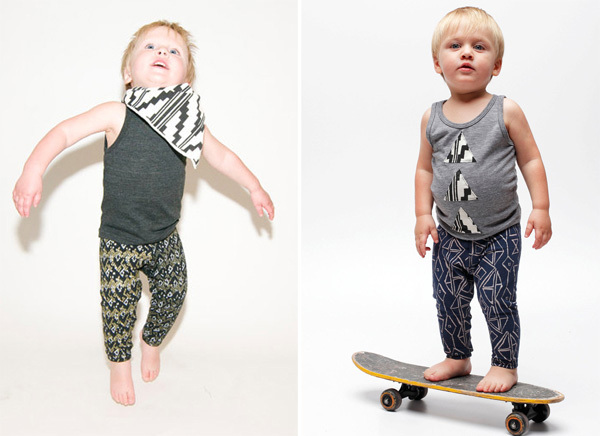 Babyologists, prepare to go cross-eyed over the coolest leggings going around from Thief and Bandit Kids! I can’t express my love for these enough – made for some seriously stylish lounging, all these splendid geometric style designs from Thief and Bandit are screen printed by hand on to beautiful stretchy, durable, perfect for play fabric. Looking pretty cool for both the lasses and the lads, my fashion forecast barometer sees Thief and Bandit Kids leggings becoming a wardrobe staple and don’t they beg to be teamed with a pair of awesome coloured Converse kicks? In the event you want to be a little matchy-matchy with your preschooler or for mums out there wanting a slice of the Thief and Bandit action – you absolutely can with Thief and Bandit ladies leggings, in the same prints and all! I really want a pair. Or three pairs even. Thief and Bandit Kids leggings are priced $45 and available at Minibots.